MAMA members were well represented at the 35th Space Symposium in Colorado Springs April 8th thru 11th. Leaders from commercial, government and military space from around the world attended to discuss, address and plan for future achievements in space. 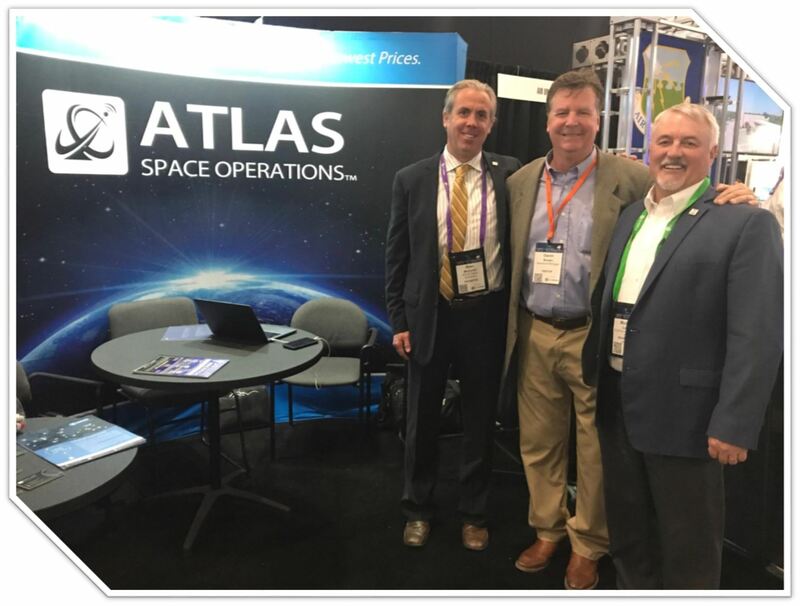 MAMA Member Atlas Space Operations' Sean McDaniel and Mike Carey joined with MAMA's Gavin Brown at the 35th Space Symposium. April 3rd & 4th. Warren, MI. MAMA was honored to host the Air Force Research Laboratory booth in the MAMA Aerospace pavilion at MDEX. 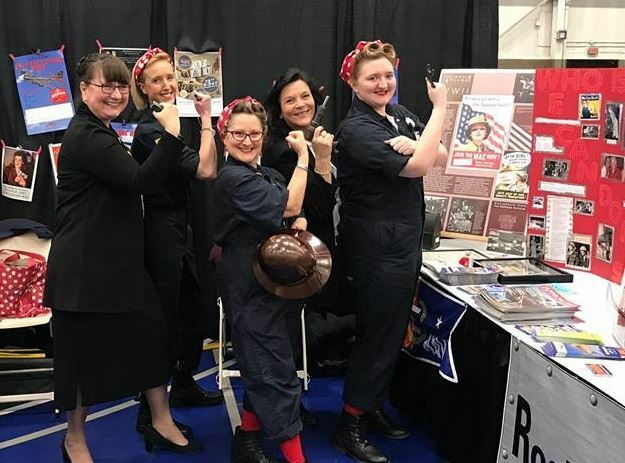 In addition to staffing the AFRL information booth, Lenell and Kim took a few minutes to join with "Rosies" to celebrate and honor the crucial importance women played in making Michigan's "Arsenal of Democracy" so pivotal in winning WWII. All MDEX attendees had the opportunity to hear Kim and Lenell share an Overview of the AFRL, update on the Science and Technology 2030 initiative and provide valuable information on how to partner with the AFRL. 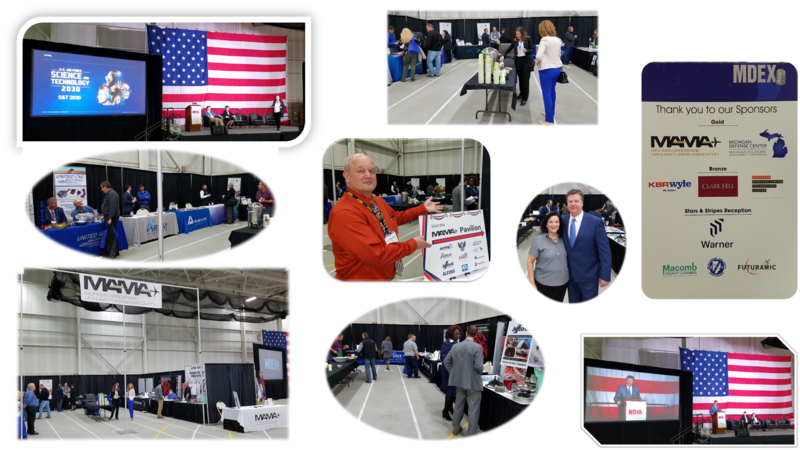 MAMA Members including the AFRL, the Air Force Association, Array of Engineers, Jetool, LIFT, Alfing, PPG, United Aerospace CNC, VTC, Buehler and Saginaw Industries all enjoyed welcoming MDEX attendees into the MAMA Aerospace Pavilion. Senator Michael D. MacDonald (R - 10th Dist.) and Representative Joe Tate (D - 2nd Dist.) 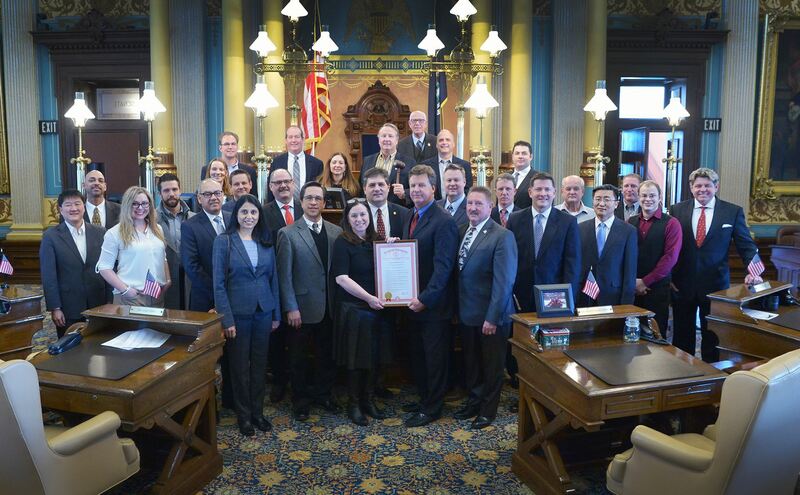 announced the formation of the Legislative Aerospace and Defense Caucus for the 100th Michigan Legislative Session. 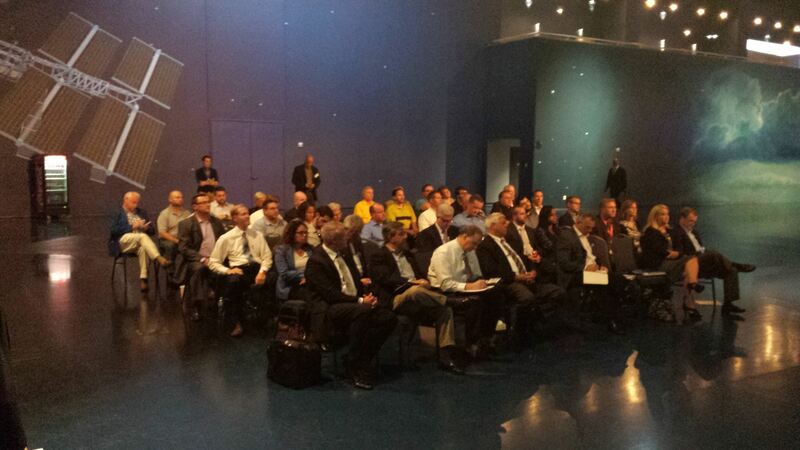 The mission of the caucus is to educate and promote the emerging aerospace and defense industry in Michigan. 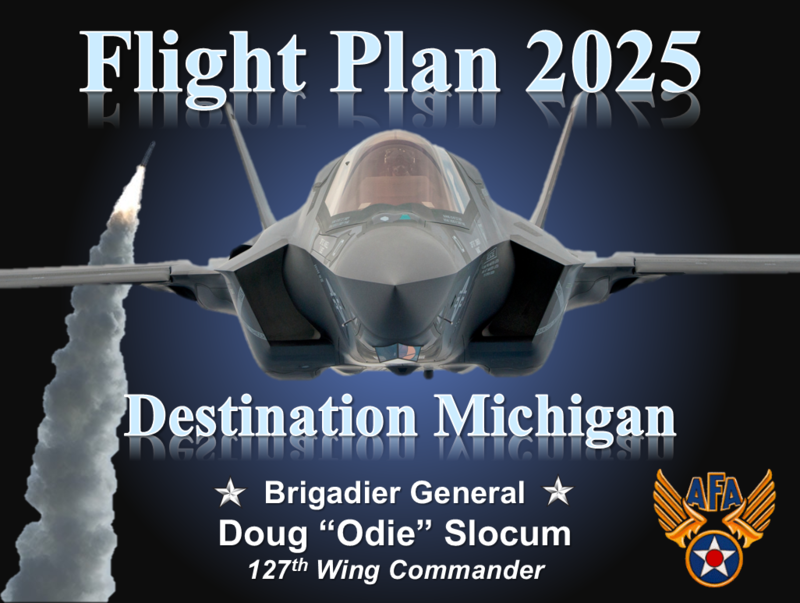 The caucus will meet to hear from prominent industry leaders, national defense officials and military generals and to help facilitate growth in employment and investment in Michigan’s Aerospace and Defense industry. 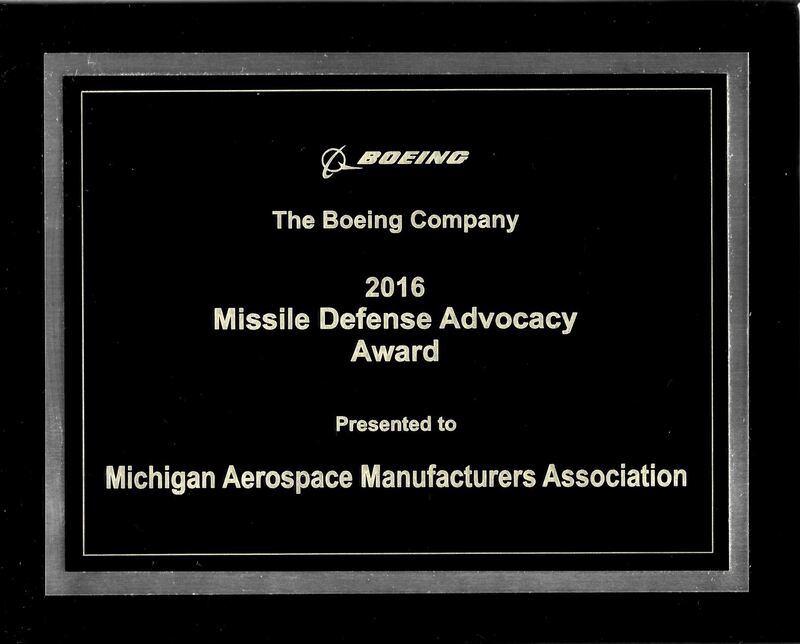 The Michigan Aerospace Manufacturers Association looks forward to supporting the mission of the Michigan Aerospace and Defense Caucus. Click Here to read the organizational invitation. 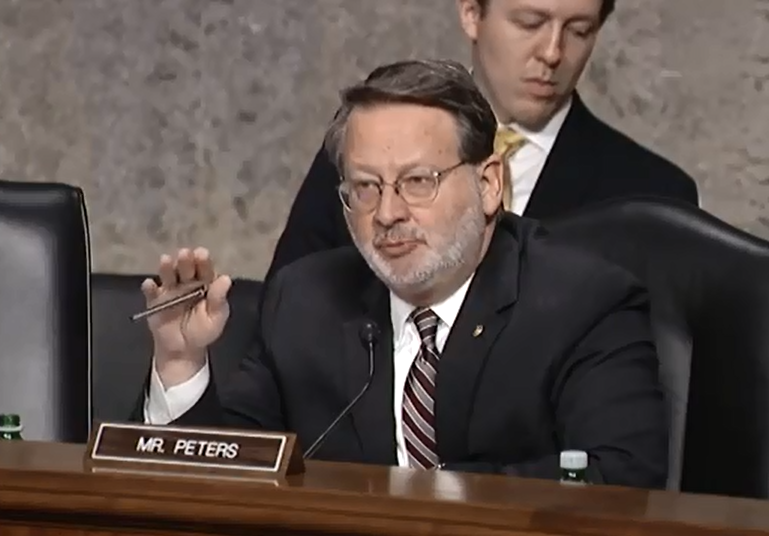 Michigan Senator Gary Peters quizzed Deptartment of Commerce witness Kevin M. O'Connell, Director of the Office of Space Commerce, about the Michigan Launch Initiative at today's Senate Science Committee hearing on "The New Space Race: Ensuring US Global Leadership on the Final Frontier"
Satellites, spaceports, and heat-treated aircraft parts: these are a few elements of Traverse City’s growing aerospace industry. 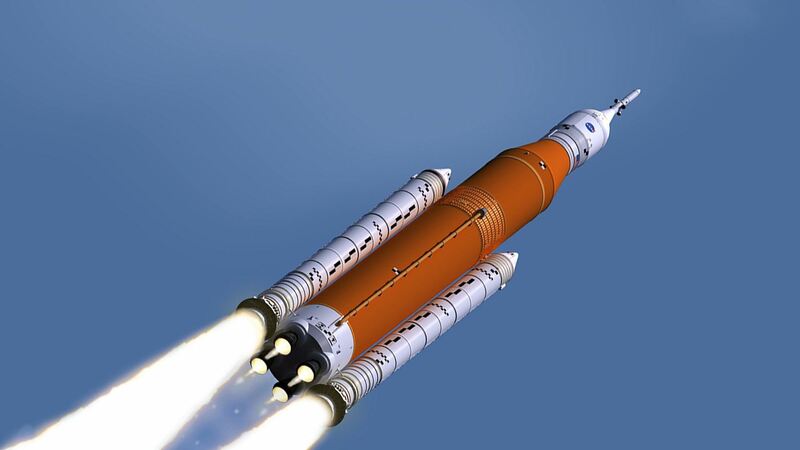 Michigan's aerospace industry plans to install launch facility by 2022. Enjoy "Rise of the Rockets" by NOVA on PBS. 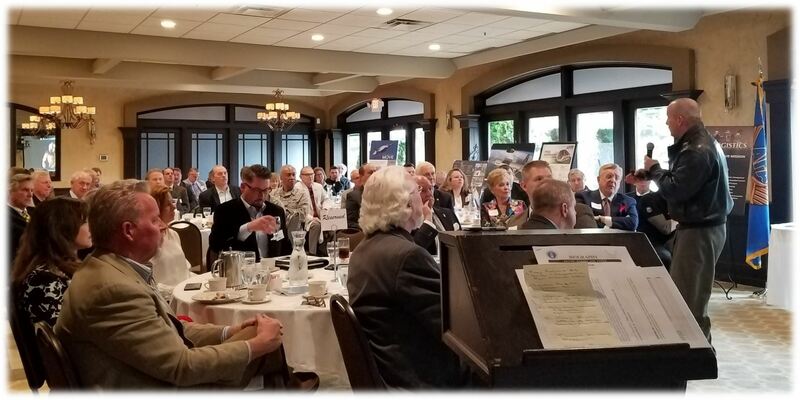 MAMA Executive Director Gavin Brown presented “Michigan’s Launch Initiative & Potential Impact on Michigan’s Economy” at the Michigan Air Force Association's inaugural "Business Over Breakfast" event held Wednesday February 20, 2019 at Villa Penna in Sterling Heights. More than seventy business and community leaders attended. 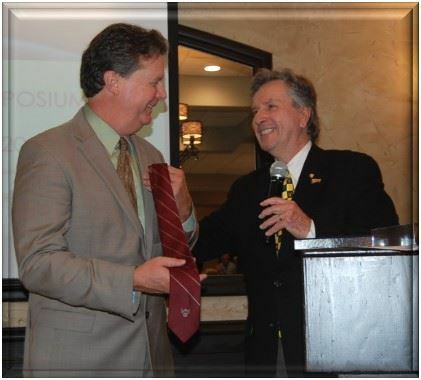 AFA President Randy Whitmire presents MAMA Executive Director Gavin Brown with an official AFA necktie. The Michigan Launch Initiative is taking-off!! A MAMA delegation led by Gavin Brown, MAMA Executive Director, met with Secretary of the Air Force Heather Wilson to brief her and her staff about the Michigan Launch Initiative. 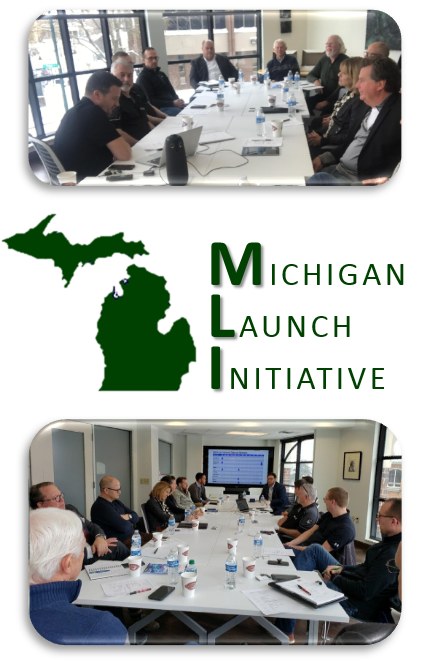 The Northern Michigan Business Consortium, coordinated by Adam Williams, met to review the technology and economic development opportunities associated with the Michigan Launch Initiative. 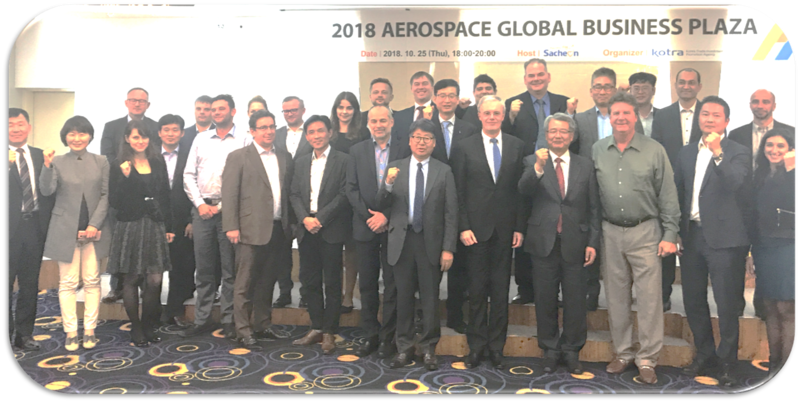 MAMA Represented Michigan Aerospace Manufacturers at the 2018 Aerospace Global Business Plaza held in connection with the Sacheon Aerospace Expo October 24-26, 2018 in South Korea. 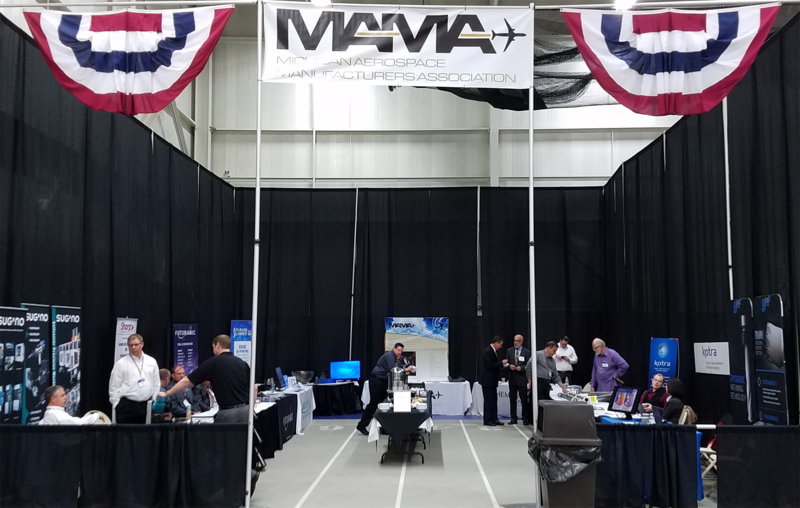 More than fifty Michigan Aerospace Manufacturers participated in MAMA's Air Force Research Laboratory Industry Day on October 23, 2018. 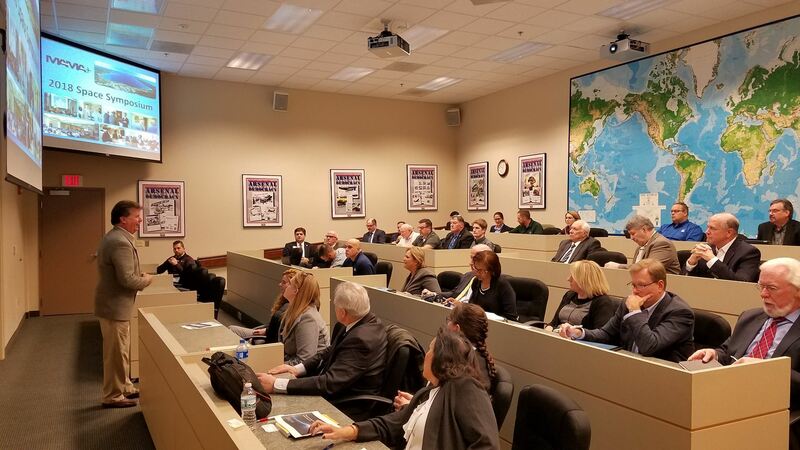 The program included presentations on the Air Force's 2030 Science and Technology Outreach Program, How to Partner with the Air Force Research Laboratory, and Other Transaction Agreements (OTA) that streamline and simplify doing business with the AFRL. Each attendee had the opportunity to meet one-on-one with AFRL representatives for 10 to 15 minutes to promote their unique technological capabilities and interests. 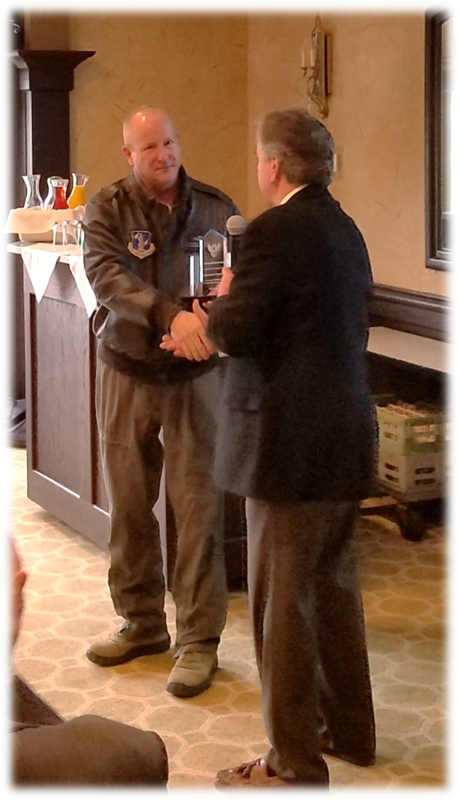 The AFRL representatives then connected each attendee with the scientist, engineer or program manager for whom the technology was most appropriate. 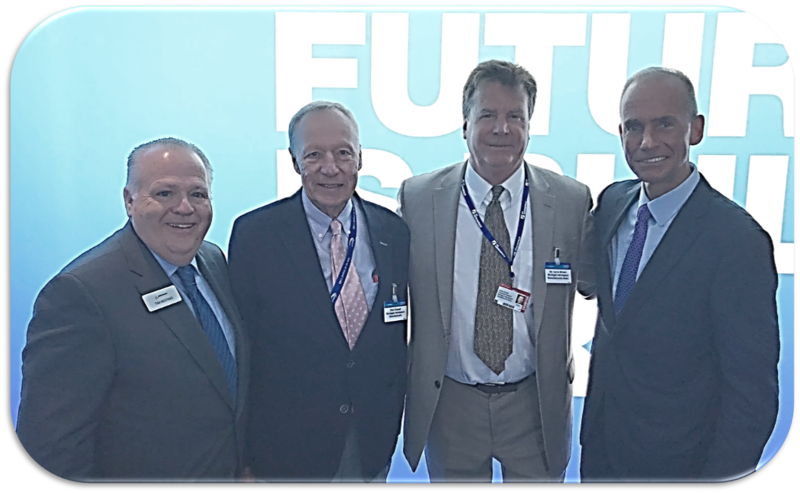 Tim Keating, Executive Vice-President of Boeing; Richard Rassel, Chairman of Butzel Long; Gavin Brown, Executive Director of MAMA; Dennis Muilenburg, President and CEO of Boeing. 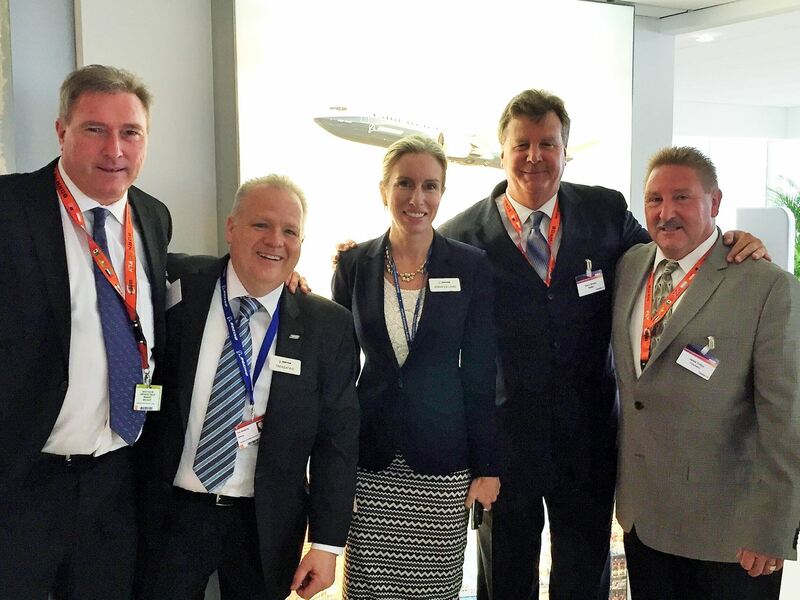 Jennifer Lowe, Boeing; Tim Keating, Boeing; Gavin Brown, MAMA; Jamie Tollon, Futuramic; Paul Weisbrich, D.A. Davidson & Co.; Richard Rassel, Butzel Long. 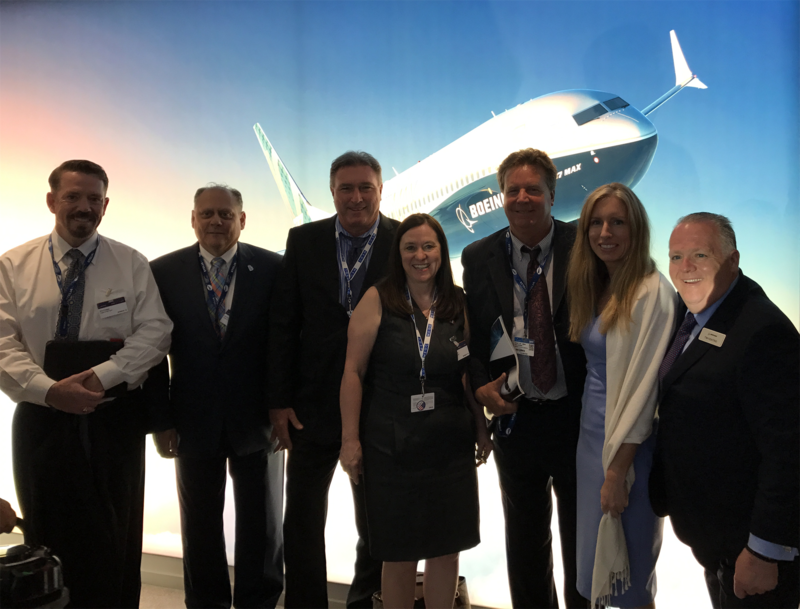 The Michigan Aerospace Manufacturers Association and the Michigan Economic Development Corporation held a Welcoming Reception to the 2018 Farnborough International Airshow. The reception will be held in the Penthouse Suite of the internationally renowned Radisson Blu Edwardian Hampshire Hotel centrally located in the heart of London. 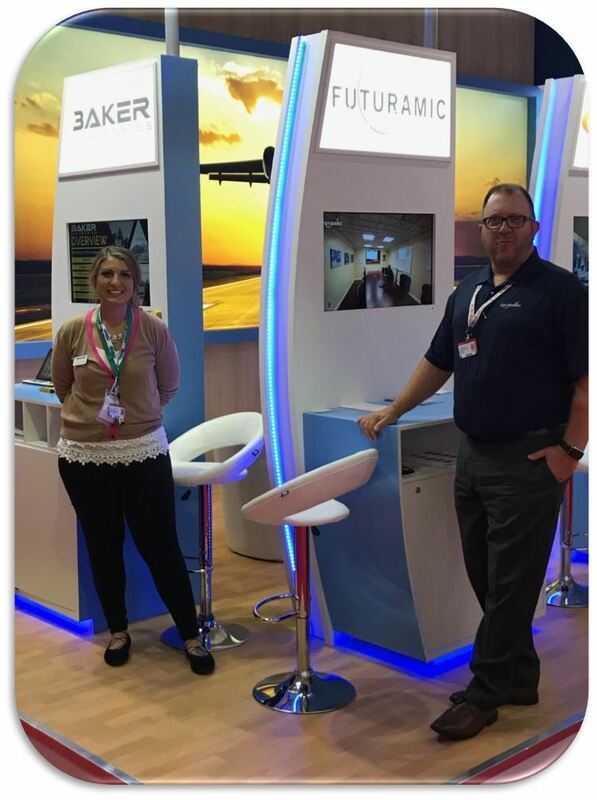 MAMA member Barron Industries is exhibiting at the Farnborough International Airshow July 16th thru 20th. 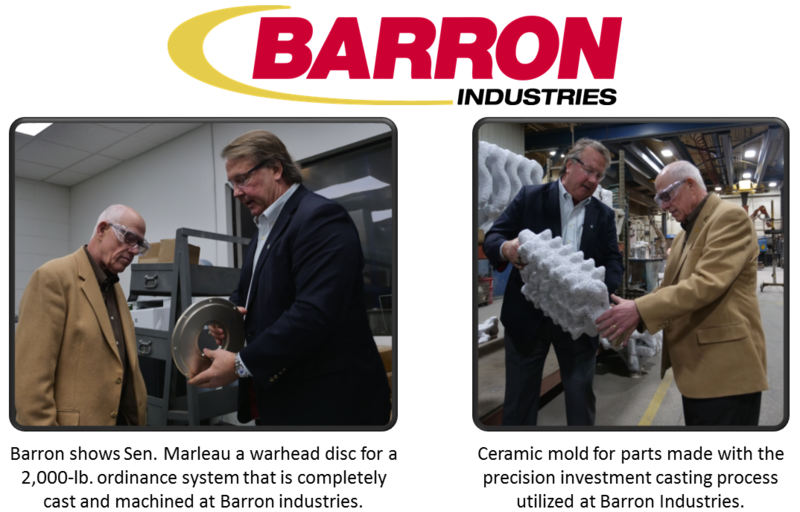 Barron Industries recently won an Investment Casting Institute award for an aerospace component the company converted from a fabrication made of five separate machined parts that were bolted and welded together. AS9100D Certified and NADCAP accredited for non-destructive testing. 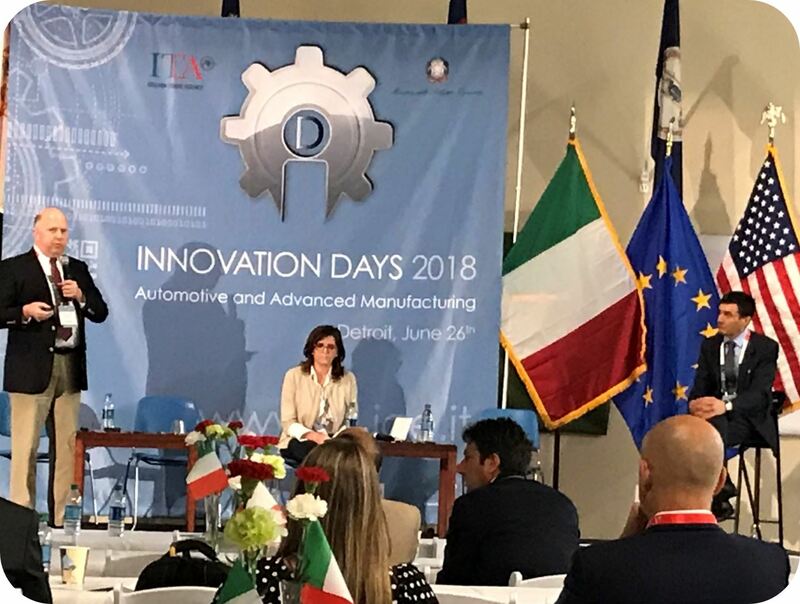 Sterling Heights, MI - MAMA was privileged to sponsor the Italian Trade Agencies' INNOVATION DAYS 2018 event in Michigan. Attending companies browsed the Italian participants' innovations in materials, machines, and processes and had the opportunity to engage in B2B meetings with prospective customers, suppliers and partners. 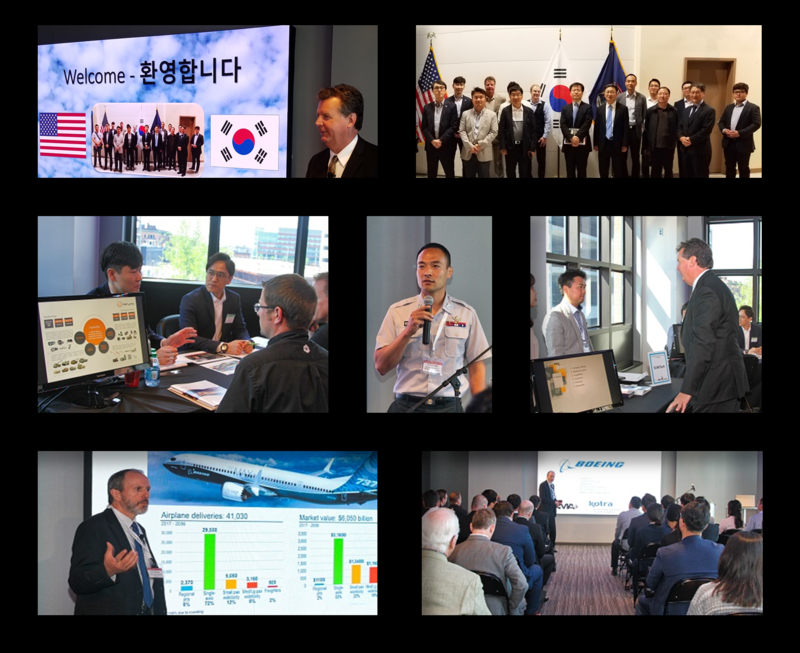 On May 23rd & 24th the US-Korea Business Summit 2018 included a track on Aerospace and Defense co-hosted by MAMA. 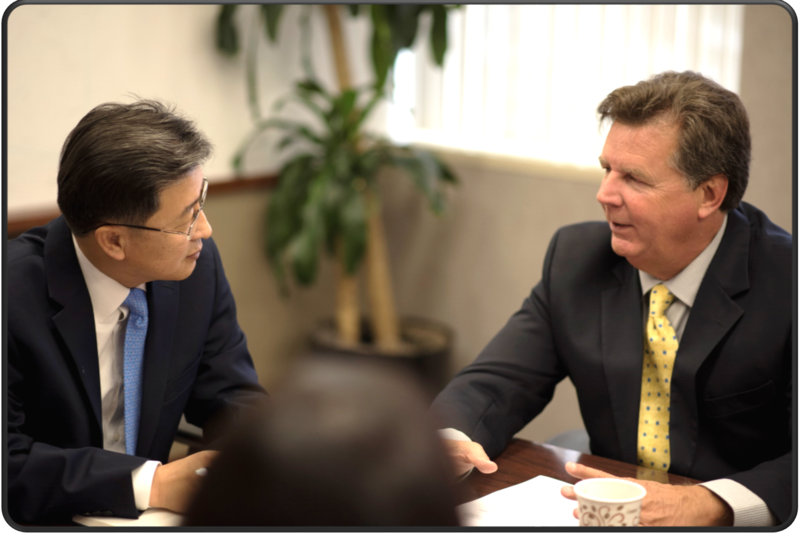 Korean and US companies interested in exporting and/or developing joint ventures/partnerships benefited from information packed presentations and B2B meetings. "With this initiative, we are going out to listen to Americans from higher education to small and large businesses to understand what basic and applied technologies will help us create the next game-changing inventions for 2030 and beyond." 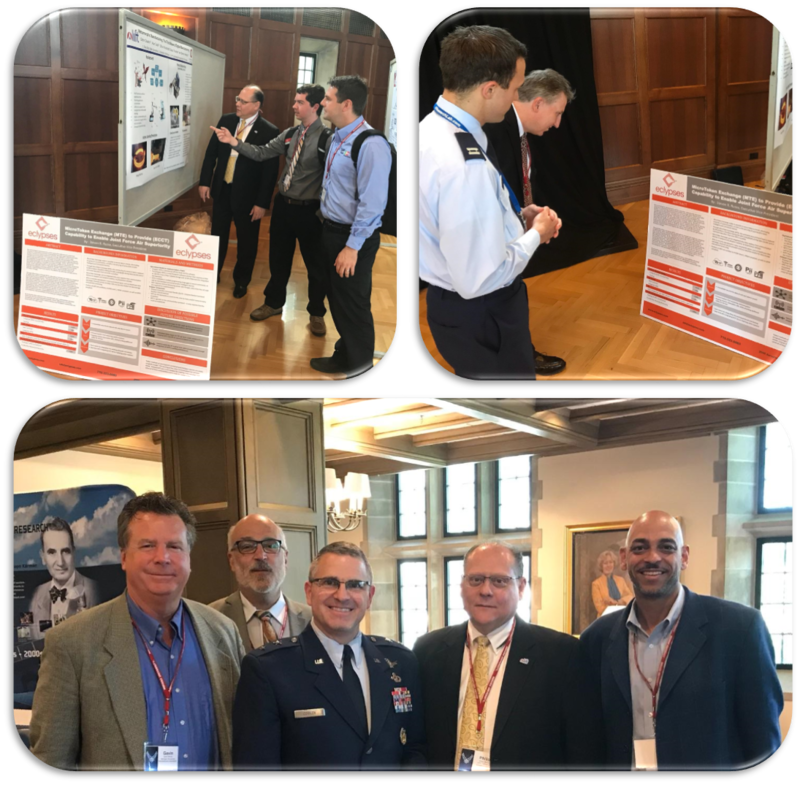 The MAMA Delegation to the United States Air Force Science and Technology 2030 workshop at Indiana University was warmly received. The delegation presented six different new technology and research proposals that will help the USAF fulfill their mission objectives. Gavin P. Brown, Executive Director, Michigan Aerospace Manufacturers Association; Dennis Atkinson, Principal, GAEMS, Inc.; Maj. Gen. William T. Cooley, Commander, Air Force Research Laboratory, Wright-Patterson Air Force Base, Ohio; Phil Chizek, Director, Business Developemt, LIFT; Ronald Butler, Principal, GAEMS, Inc.
At $16 billion, India’s aviation market is currently the 9th largest in the world and is expected to be the 3rd largest by 2020, and by 2030, the largest. Over the next decade, the market is expected to reach 337 million domestic and 84 million international passengers. This growth will create demand for new aircraft, air navigation service technologies, airport security equipment, and increased infrastructure. India is one of the largest importers of conventional defense equipment in the world. 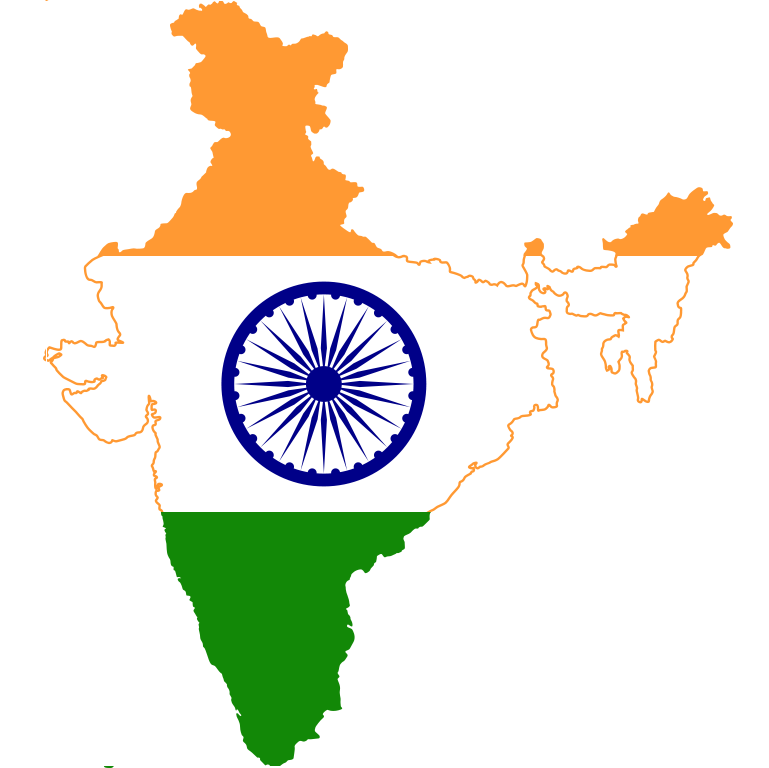 India imports approximately 60% of its defense requirements. This year’s capital expenditure budget of $12.72 billion has increased slightly from last year. We anticipate significant opportunities for U.S. exporters in the defense sub-sectors. Mr. Shantanu Sarkar, Commercial Advisor in the U.S. Commercial Service office in Kolkata, lead a roundtable discussion of the opportunities for aerospace and defense companies who wish to take advantage India's rapidly growing aerospace and defense sectors. Over 2,500 visitors attending the MDEX had the opportunity to visit the MAMA pavilion and meet with a variety of MAMA members: 5ME, LLC; Chemical Bank; Futuramic Tool & Engineering; GAEMS; KOTRA, Sugino, Sharp Cutter, Omnico AGV; SA Partners; Sciaky, Inc.; Sharp Cutter Grinding Company and Sugino Corporation. MAMA pavilion exhibitors hosted a continental breakfast for early-bird attendees to kick-off two days of networking, lead generation and knowledge gathering. Gavin Brown, Executive Director, Michigan Aerospace Manufacturers Association; Major General Michael A. Stone, Commander, 46th Military Police Command, Assistant Adjutant General - Army Michigan National Guard and Deputy Director, Michigan Department of Military & Veterans Affairs, and John Couch, Vice President, Futuramic Tool & Engineering Company; engaged MDEX attendees in a wide ranging review of Michigan's Role in Missile Defense. 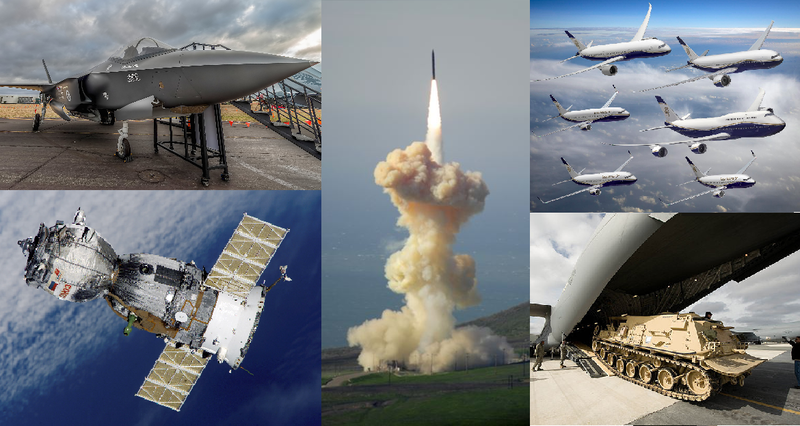 From Michigan's role in Ground-Based Midcourse Defense (GMD), to launching of a constellation of low orbit satellites, to harnessing Michigan's manufacturing excellence, "Michigan's Role in Missile Defense" was fully reviewed. 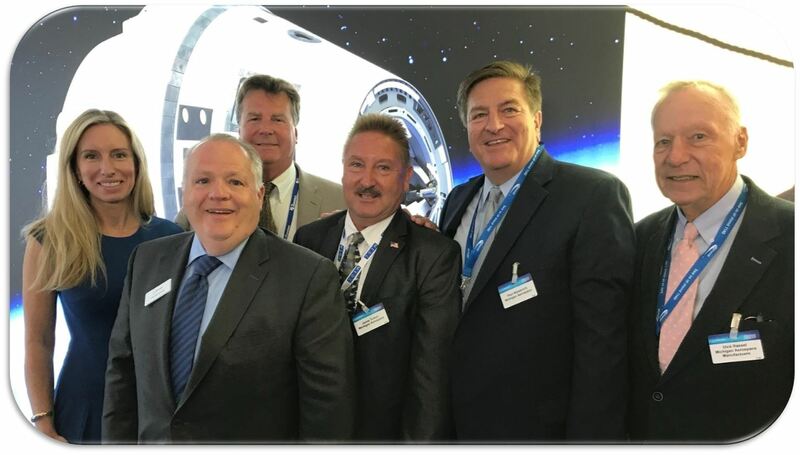 Senator Jim Marleau (R-District 12) met Barron Industries President Bruce Barron when he joined a group of other Michigan companies at the State Capital for the first ever Aerospace Day organized by MAMA earlier this year. Since Barron Industries is located in the senator’s district, Barron invited him to tour the metal manufacturing plant, and Marleau, who put himself through college working at a die casting operation, took him up on the offer. MAMA member Jedco, Inc., of Grand Rapids, has announced plans to invest over $9 million dollars expanding their manufacturing facilities and adding new machinery and equipment. The investment, made over the next three years, will result in approximately 40 new full-time jobs. Jedco Inc. serves the precision metal fabrication needs of the aerospace industry. Jedco Inc. is a leading supplier of fabricated sheet metal and complex machined assemblies to the domestic and global aerospace industry. Jedco manufactures titanium fabrications, combustion chamber assemblies, transition ducts, heat shields and exhaust nozzles/mixer ducts for military aircraft engines. 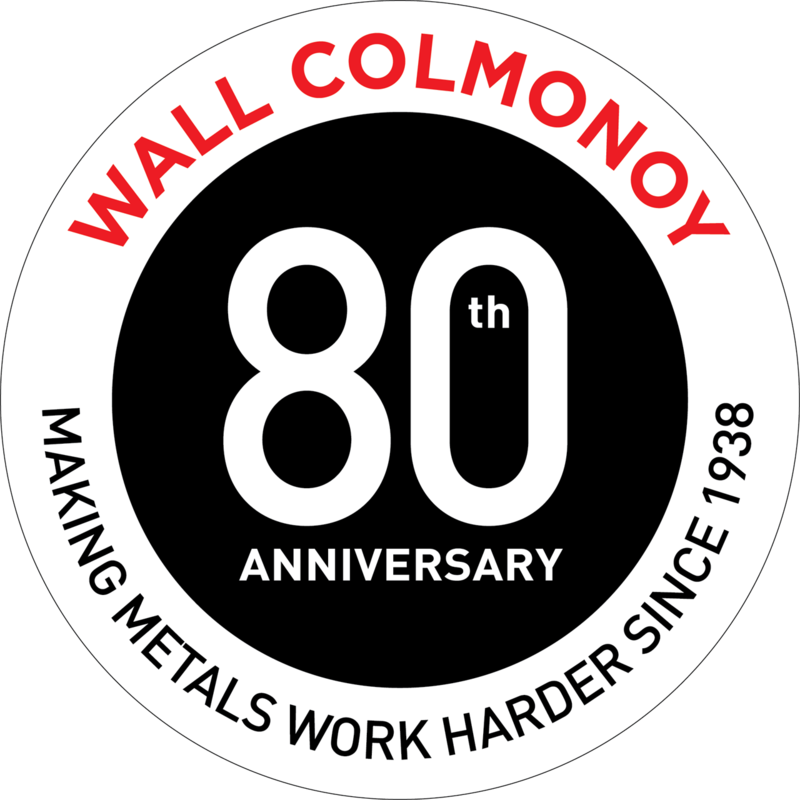 Wall Colmonoy is pleased to announce its 80th Anniversary of business. “Making Metals Work Harder Since 1938”. "Making Metals Work Harder Since 1938" highlights Wall Colmonoy’s innovative products and services which are fundamental in keeping airplanes in the sky, glass bottles in production, food fresh, pumps pumping, nuclear turbines powering, and transportation greener. Wall Colmonoy is a global materials engineering group of companies engaged in the manufacture of advanced metal coatings and components. It was established in 1938 in Detroit, Michigan by Albert F. Wall. Phil Chizek, LIFT at 2018 Pure Michigan Aerospace Summit. 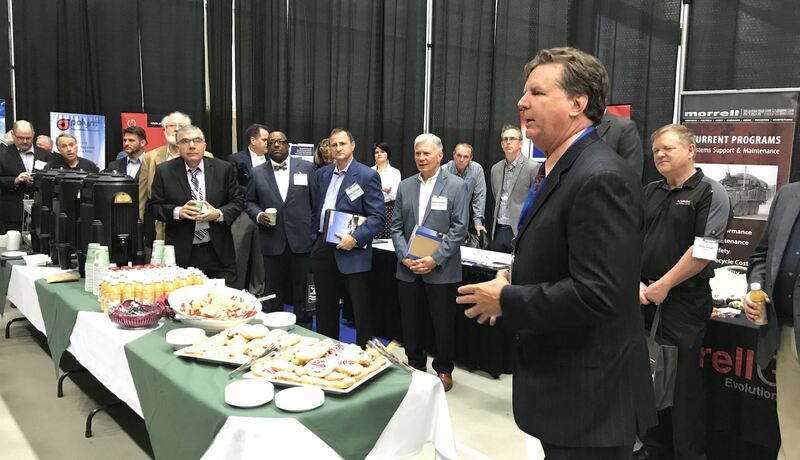 Detroit, MI The 2018 Pure Michigan Aerospace Summit held on February 21 at the Little Caesars Arena attracted over 400 Michigan companies interested in growing in the aerospace sector. 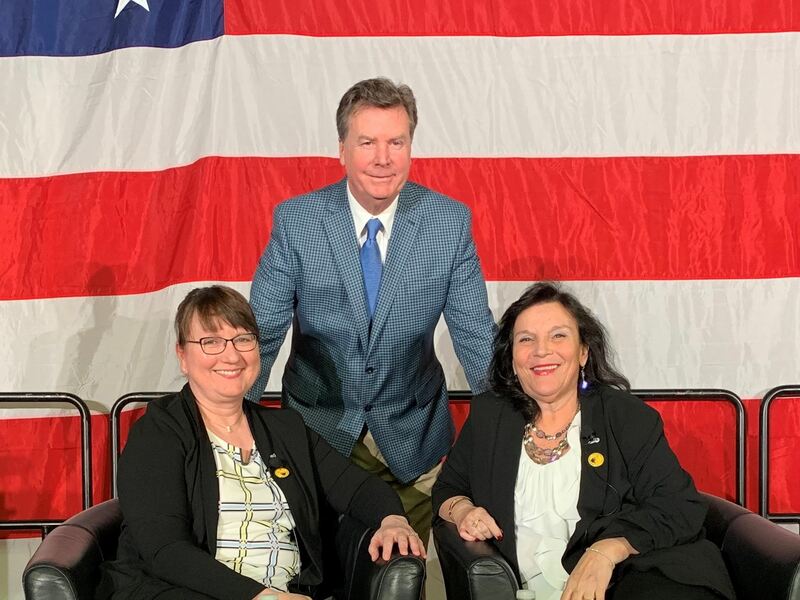 MAMA member Boeing was honored to be awarded the Pure Michigan Business Connect Supply Chain Achievement Award at the summit. The Michigan Aerospace Manufacturing Association continues to support the industry through research and development in the aerospace supply chain. While identifying opportunities for cost savings, the association has taken a proactive stance in the development of additive manufacturing technology and battery logistics. 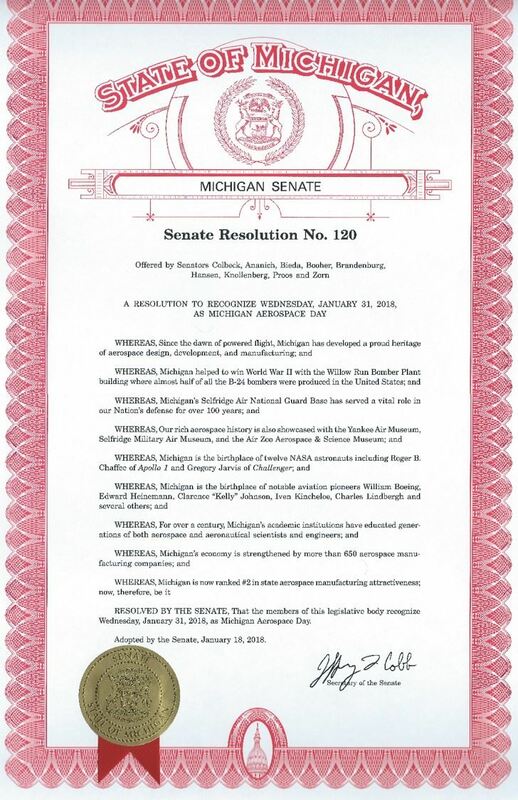 These efforts have helped attract investment in Michigan’s aerospace industry. The Michigan Aerospace Manufacturers Association (MAMA) held an Aerospace Day at the Michigan Capitol Building on January 31, 2018. 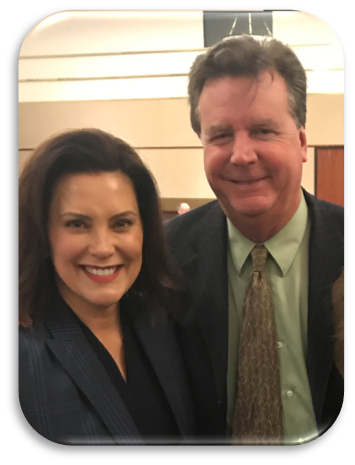 MAMA members met with their legislators to highlight the economic impact the aerospace industry contributes to Michigan's economy. Several MAMA members had information tables in the 1st Floor West Corridor of the Capitol building. Weldaloy sponsored a Box Lunch for the Legislators, Senior Staff and MAMA members. 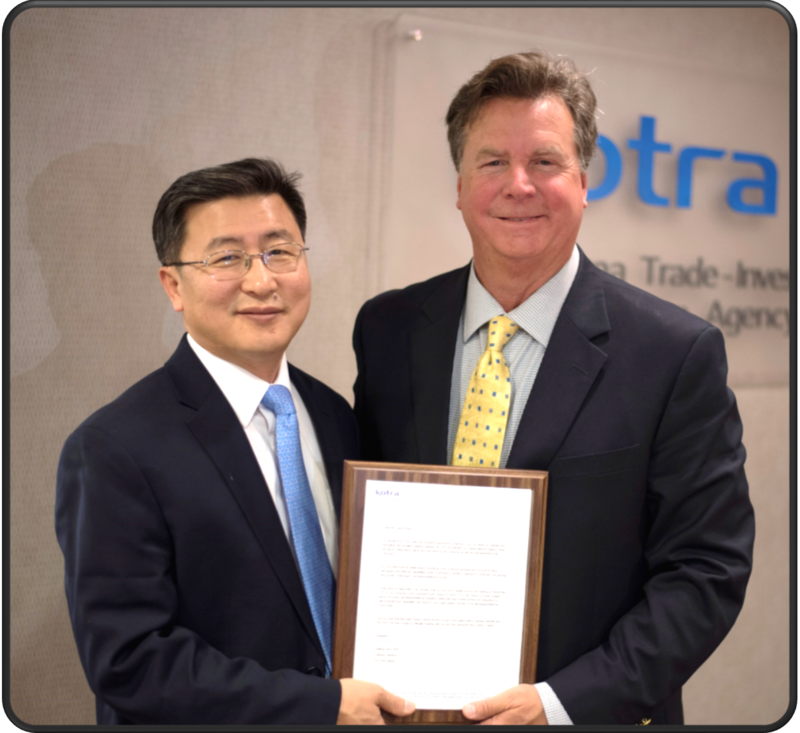 The Korea Trade-Investment Promotion Agency and the Michigan Aerospace Manufacturers Association agree to jointly arrange a trade mission involving a select group of Korean aerospace/defense suppliers visiting Michigan in early 2018. 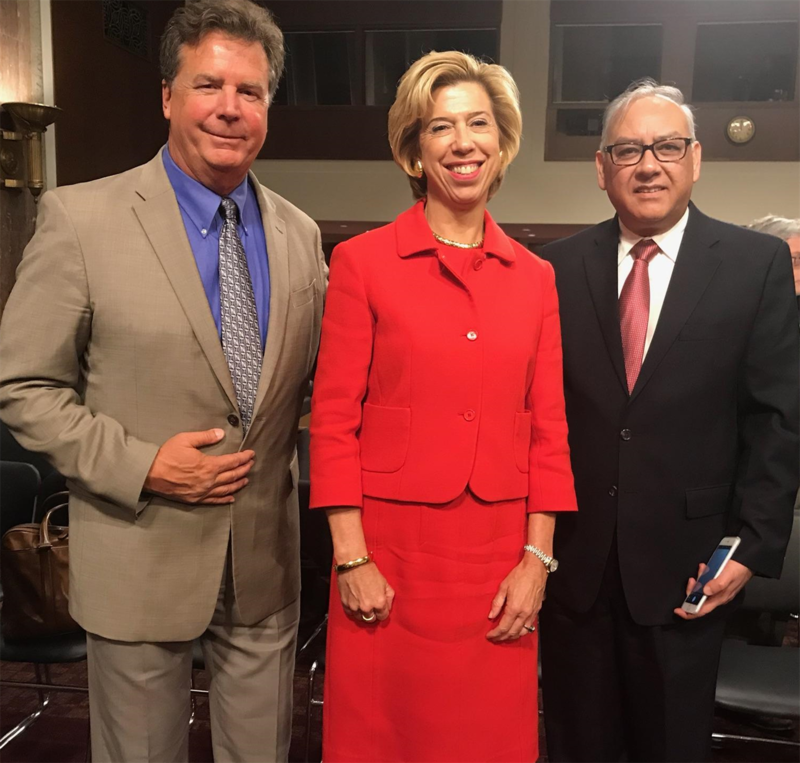 During a break in testimony before the U.S. Senate Committee on Armed Services, regarding Department of Defense Acquisition Reform Efforts, the Honorable Ellen M. Lord, Under Secretary of Defense for Acquisition, Technology and Logistics, met with Gavin Brown, MAMA Executive Director and Anil Menawat Ph.D. President and COO of MAMA member Menawat and Company. Mr. Brown and Dr. Menawat traveled to Washington to brief Senators, Representatives and Department of Defense officials on MAMA's Aggregate Demand Model (ADM) that is powered by Menawat's ProFIT-MAP Technology. ADM integrates supply networks through advanced collaboration technology which reduces costs, improves quality, speeds delivery, and mitigates acquisition risks. MAMA Member 5ME's Ice Cold Machining Open House event at their Warren, Michgan Technology Center was a huge success! Held on November 9th, the event had an attendance of nearly 100 people with companies represented from coast to coast and from Canada to Mexico; all of whom were looking for ways to improve their manufacturing efficiency, reduce costs, and optimize profitability. Showcasing our patented 5ME® Cryogenic Machining Technology and FREEDOM™ IoT Software Platform, 5ME demonstrated next generation manufacturing of Titanium, Steel, and Iron components. With key launch partners such as Lockheed Martin Aeronautics, 5ME looks to work with MAMA on making Michigan a key state in the advancement of aerospace manufacturing technologies. WASHINGTON, DC – U.S. 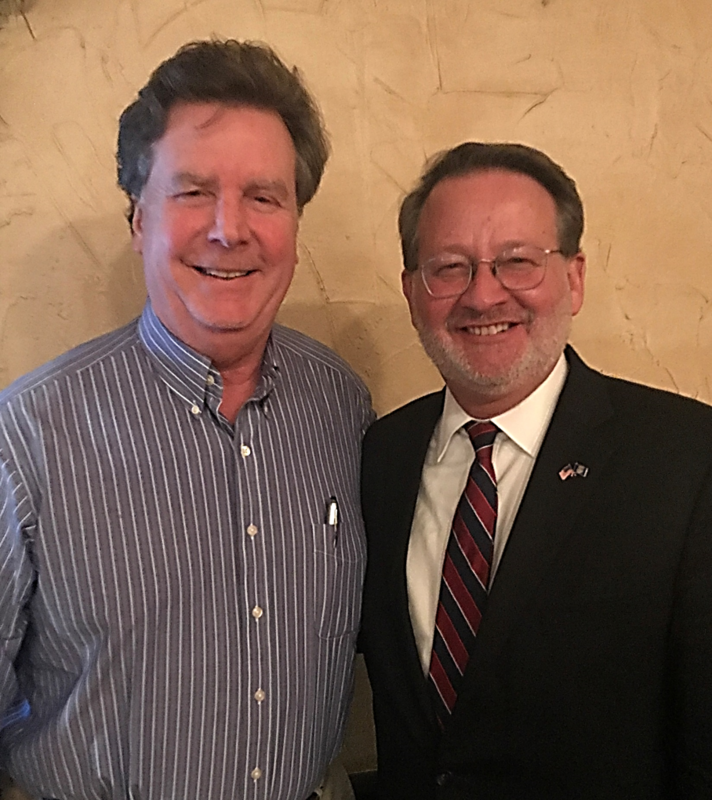 Senator Gary Peters (MI), a former Lt. Commander in the U.S. Navy Reserve and a member of the Senate Armed Services Committee, today helped pass major defense legislation with over a dozen provisions he authored supporting Michigan’s growing defense industry and boosting America’s military preparedness. The final National Defense Authorization Act (NDAA) conference report, which sets Department of Defense (DoD) policy was passed by the House of Representatives and Senate this week with bipartisan support and now heads to the President’s desk to be signed into law. Click here for highlights of Senator Peter's provisions in the NDAA. D. Scott Watkins, CEO has announced that the proven value of mobile video monitoring center has driven the need to expand both facilities and personnel. The Troy, Michigan facility will increase its footprint by 50% and triple the number of employees in order to help us execute our plan to support tens of thousands of vehicles across the country. MAMA led delegation to the Aerospace Global Business Plaza 2017 in Sacheon-si, South Korea in October 2017. 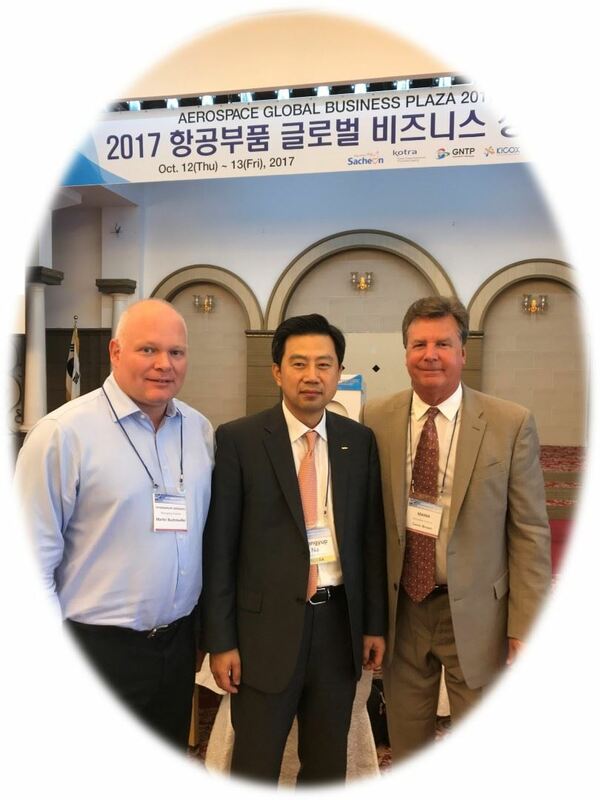 Pictured left are: Martin Buchmueller, Managing Director, Thyssenkrupp Aerospace; Chang Yup-Na, Directoer General of Global Business Cooperation Department at KOTRA and Gavin Brown, Executive Director, Michigan Aerospace Manufacturers Association. 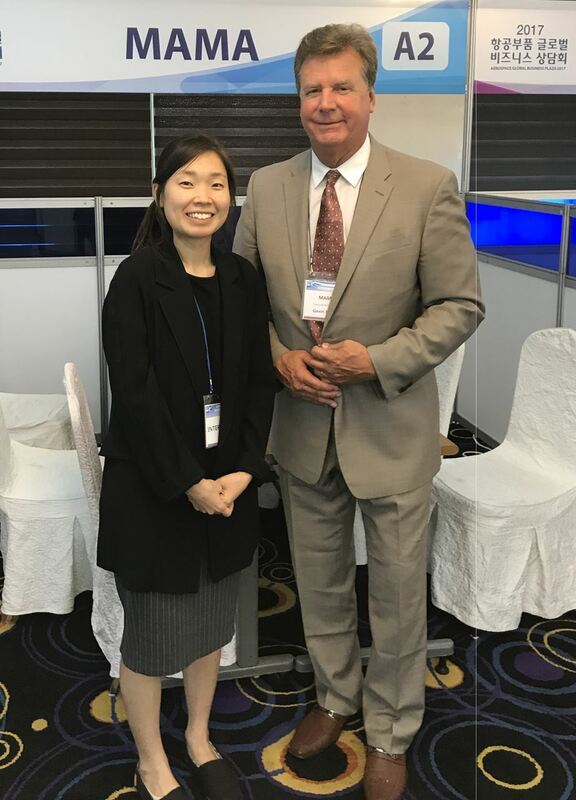 Pictured right are: Kim Boram, Translator & Interpreter and Gavin Brown, Executive Director, Michigan Aerospace Manufacturers Association. MAMA brought together an all-star team of cyber-security professionals to brief more than 40 representatives of aerospace and defense suppliers on Federal Acquisition Regulation (FAR) and Defense Federal Acquisition Regulation Supplement (DFARS) minimum cyber-security standards that go into effect on December 31, 2017. "A quicker, better and more cost effective solution is to harness the competitive innovation that animates the most robust and creative economy the world has ever seen – the USA’s private sector." 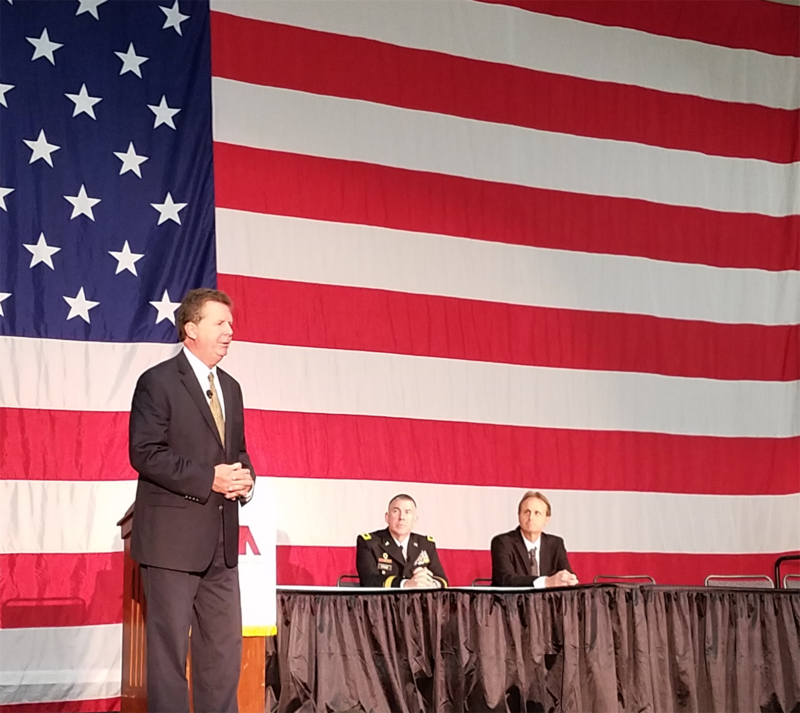 Sterling Heights, Michigan - September 15, 2017 - MAMA represented Michigan's Aerospace Manufacturers at a briefing session with Michigan Attorney General Bill Schuette, Macomb County Executive Mark Hackel, Macomb County Public Works Commissioner Candice Miller, Michigan Defense Center Executive Director Sean Carlson and other representatives of Michigan's defense industry. 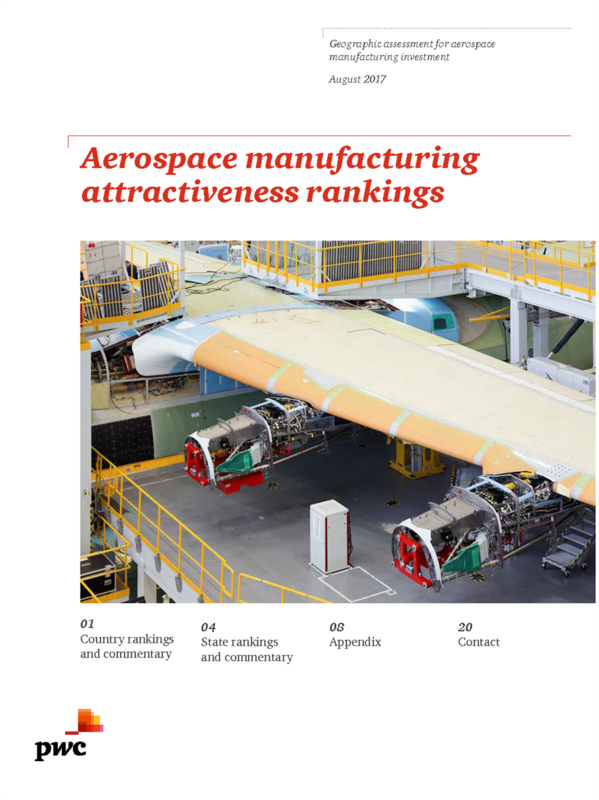 PwC's 2017 Aerospace Manufacturing Attractiveness Ranking report has been released. The USA continues to be the #1 ranked country with Michigan ranked #2 amongst the states. The index is based on a weighted score of ranking categories that include: Labor, Infrastructure, Industry, Economy, Cost and Tax Policy. 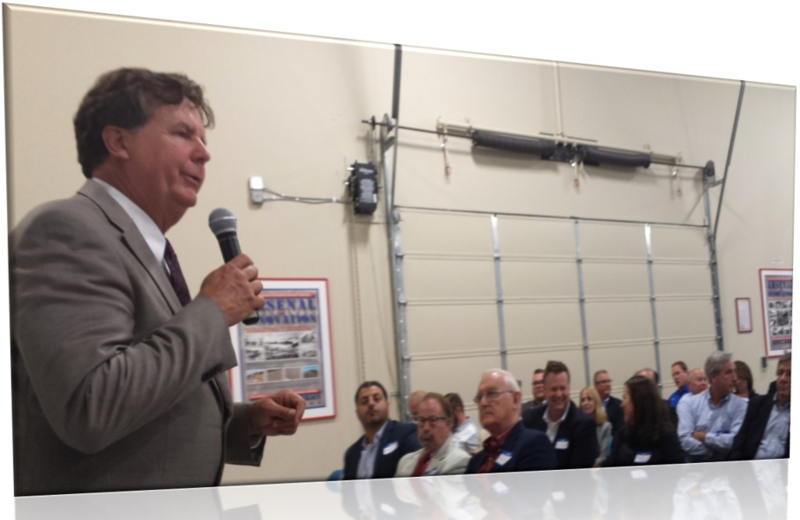 Bob Phillips, Vice President, Phillips Service Industries and Sciaky Inc.
Michigan State Senator Patrick Colbeck, U of M Masters in Aerospace Engineering, addressed MAMA members and guests. MAMA Executive Director Gavin Brown kicked-off the meeting with a report on the activities of the MAMA Delegation to the 2017 Paris Airshow and side trip to Airbus Helicopters, Safran Aircraft Engines, Henri Fabre Technocentre and the International Thermonuclear Experimental Reactor (ITER) in Saint-Paul-lès-Durance, Provence, France. Attendees were briefed on the Overview and Outlook for the Commercial, Military and Business Aviation markets, the Satellite and Missile markets, the Ground Combat Systems market and updated on the status of the Ground-based Missile Defense third missile field and the ANG F-35 basing decision. MAMA Members enjoyed a post-meeting opportunity to network with the presenters and fellow MAMA members. MAMA delegation visiting the Boeing Chalet. L to R: Bob Phillips, Sciaky; Phil Chizek, LIFT; Dave Pascoe, Weldaloy; Myra Moreland, Weldaloy; Gavin Brown, MAMA; Jennifer Lowe, VP Boeing; Tim Keating, EVP Boeing. defense companies visiting the MAMA Aerospace Pavilion at MDEX. 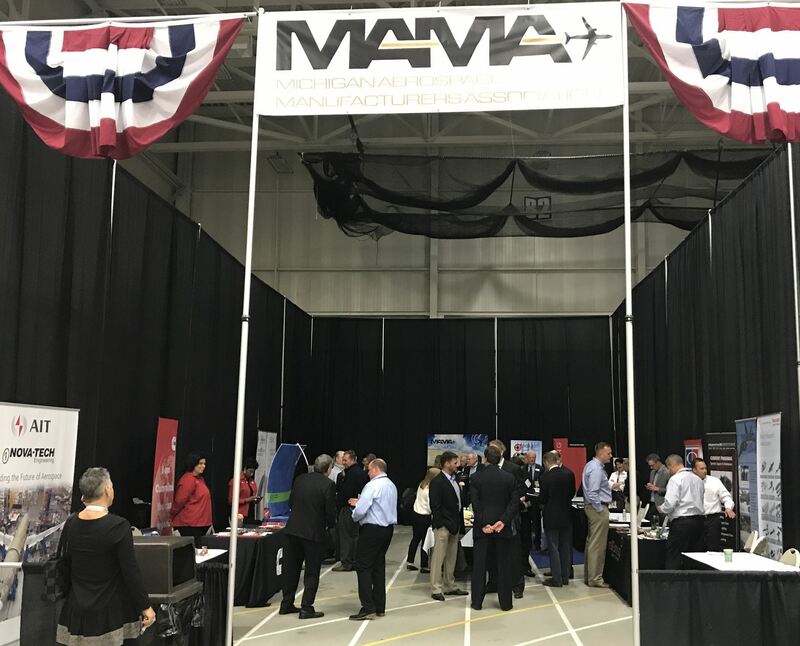 The MAMA aerospace pavilion at MDEX showcased ten MAMA member companies. MDEX visitors throughout the two-day exhibition. A large delegation of MAMA Members met with Boeing Defense, Space and Security Program and Purchasing Managers March 13, 2017 during AUSA's Global Force Symposium and Exposition in Huntsville, Alabama. "Great opportunity to get my company's capabilities in front of a major aerospace and defense contractor." -- Martyn Acreman, Matereon. "MAMA events are always worthwhile" -- Wayne Dula, Loc Performance Products, Inc.
"MAMA events are ALWAYS excellent. 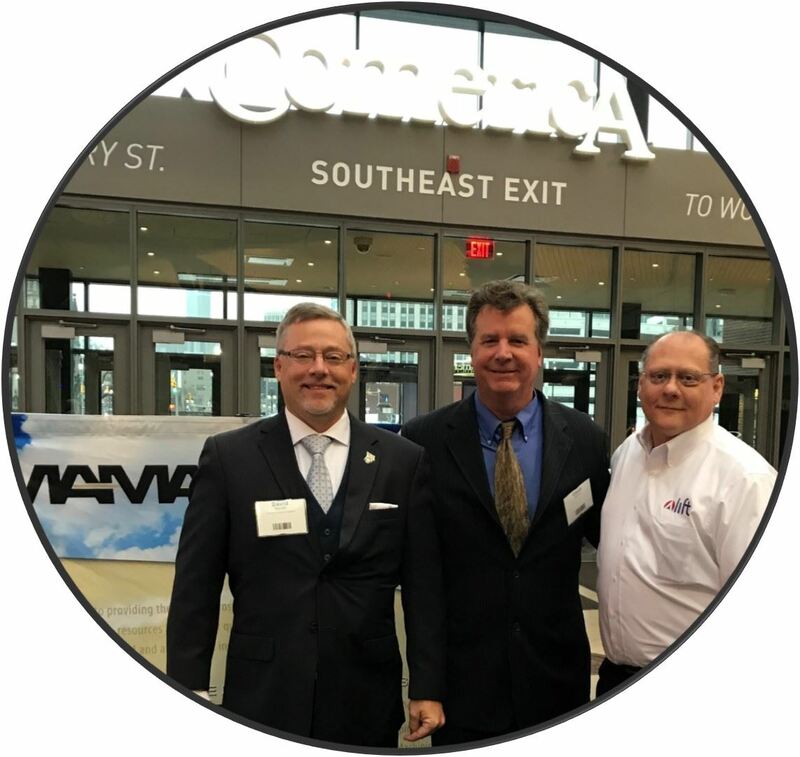 They really work hard to make these happen and they are a great benefit to all members who take part" -- Ron Morrison, Schupan, Inc.
"The groundwork and preparation leading up to the Boeing Supplier meetings was outstanding by the MAMA team. Their assistance in introducing and connecting Boeing personnel to MAMA companies is a real advantage." -- Paul Munzenberger, Design Systems, Inc.
"MAMA is not only the vehicle that delivers you to a new customer's front door, but it is a way to surround yourself with a strong network of great people." -- Jamie Spitzer, Precision Machine Inc.
Brown spoke with MiBiz regarding the opportunities and challenges for aerospace suppliers going into 2017. U.S. 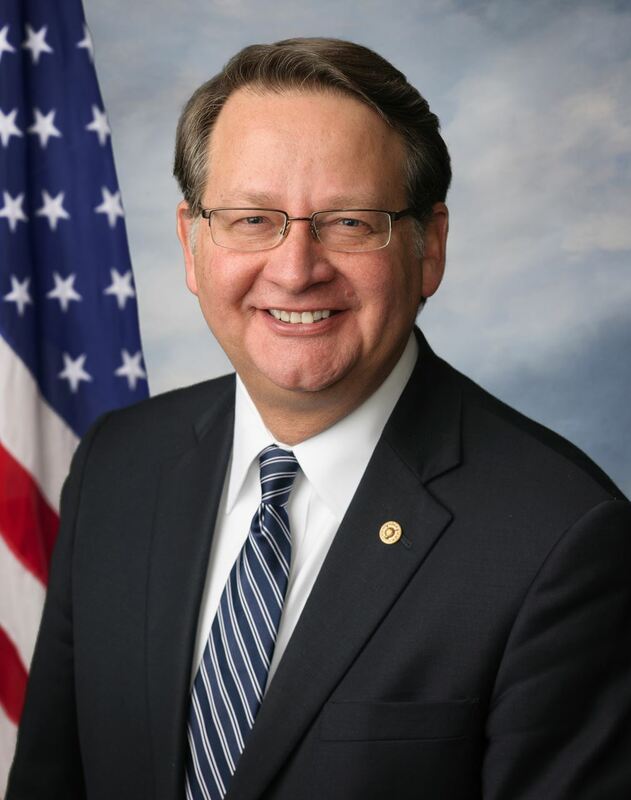 Senator Gary Peters announced he has been appointed to the Senate Committee on Armed Services for the 115th Congress, subject to ratification by the Democratic Caucus. Peters will also continue to serve on the Senate Homeland Security and Governmental Affairs Committee; Commerce, Science and Transportation Committee; and the Joint Economic Committee. 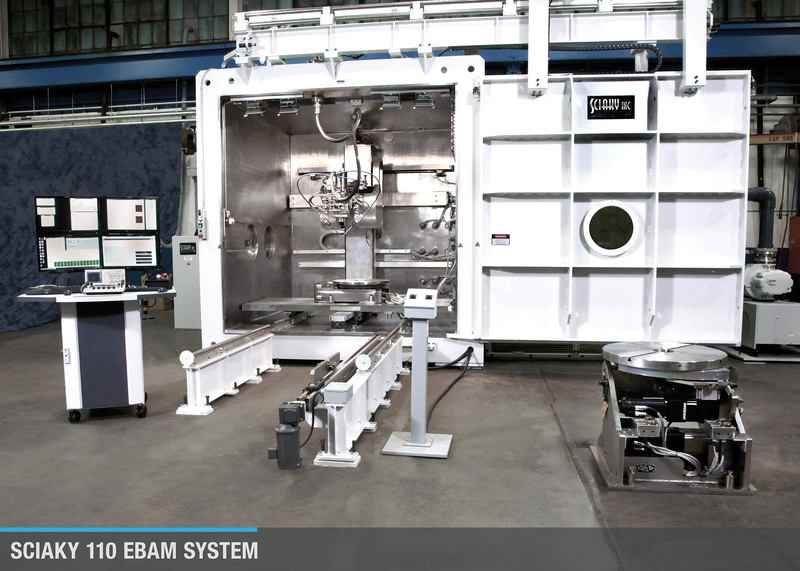 Sciaky’s Electron Beam Additive Manufacturing (EBAM™) system will help the leading aircraft manufacturer save significant time and cost on the production of large titanium structural parts. L to R: Dave Pascoe, Weldaloy; Tim Keating, EVP Boeing; Jennifer Lowe, VP Boeing; Gavin Brown, MAMA; and Jamie Tollon, Futuramic Tool & Engineering Company. 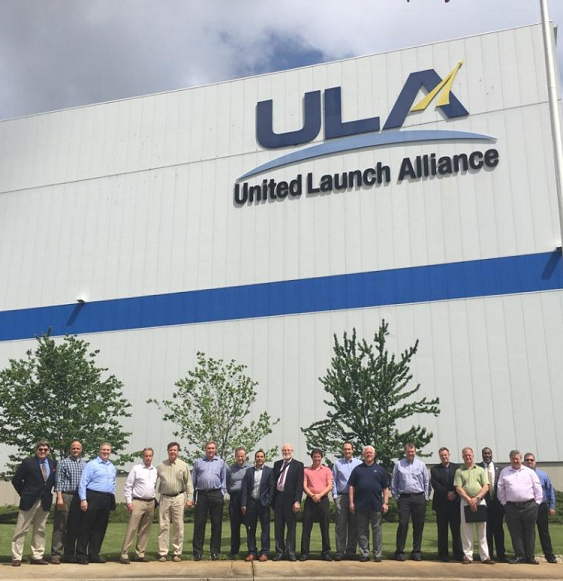 MAMA delegation visiting the United Launch Alliance facility near Huntsville, Alabama -- May 2016. 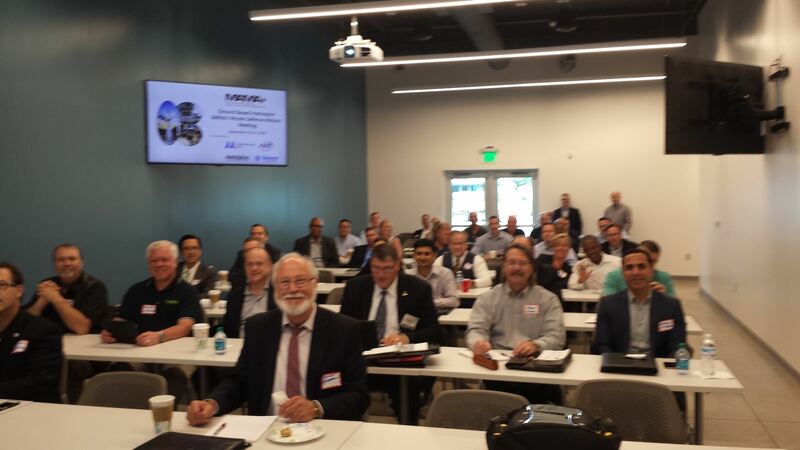 The Michigan Aerospace Manufacturers Association organized and led a delegation of twenty Michigan based aerospace suppliers to visit procurement officials at Boeing Defense, Space & Security and United Launch Alliance in Huntsville, Alabama. "I was very appreciative of the amount of resources and time that Boeing and ULA dedicated to this trip. They put aside undivided attention for our delegation, and that was excellent." "MAMA did an EXCELLENT job coordinating the right places to visit and the right people to see. This trip was so successful because it was so well planned." Full trip follow-up survey can be found here. The mission of the Michigan Aerospace Manufacturers Association (“MAMA”) is to: serve and represent the interests of Michigan’s aerospace and defense manufacturing firms with a single unified voice; to provide educational programs and industry research to its members; and to promote the State of Michigan’s aerospace and defense manufacturing community within the global industry. MAMA’s objective is to be the supply chain of choice that is recognized for taking the "costs out of cost" for services, manufactured components, assemblies and complete systems. We are designed to take the risk out of the supply chain by having the best in class suppliers for cost, quality and delivery.